First of all, this recipe on how to make bubble gum is not just a recipe, it’s a science experiment. And did you know? Ancient Greeks chewed resin from mastic trees and that was the first chewing gum. But it wasn’t until 1928 when Walter Diemer made the very first bubble gum, a chewing gum that can let you make bubbles. 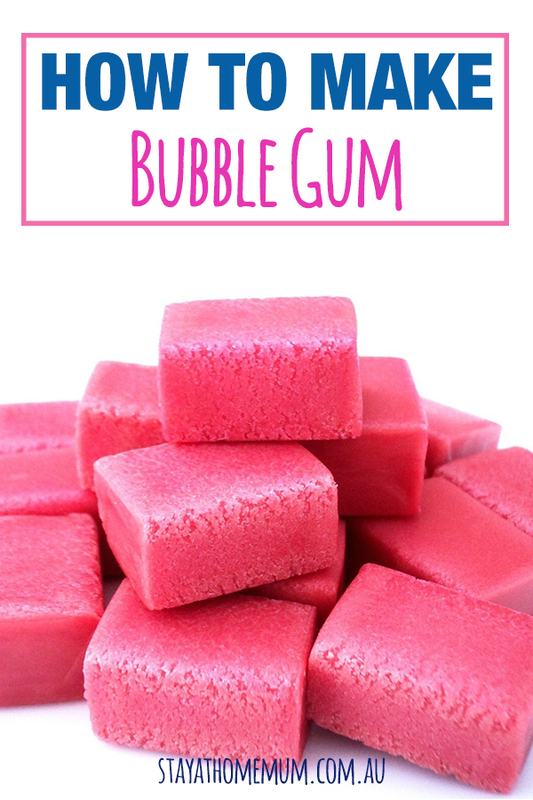 Anyway, without further ado, here’s how to make Bubble Gum! Get a microwave-safe bowl and put in the gum mix, corn syrup, glycerol, citric acid, and flavouring. Place it in the microwave for 60 seconds and give it a stir. Microwave it again for another 30 seconds and stir. Repeat the process until it’s all melted. Add Food colouring and stir again. Pour half of the sugar in a flat surface, make a well in the middle, and pour in the gum mixture in the middle. Leave it for 5 minutes to cool. Slowly knead it together and put sugar if it starts to become sticky. Once done, flatten it down with a rolling pin or with your hands then cut them however you want.